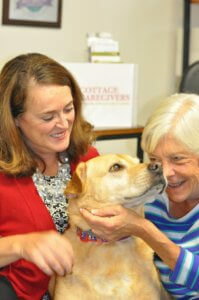 Cottage Caregivers is excited to announce our partnership with Bonnie Peterson and her dog Gurnet! Gurnet is a rescue yellow lab from Texas. He is 7 years old and attended a three-month training at Petco & passed the Adult 1 training level with his owner/handler Bonnie Peterson of Marshfield, MA. Gurnet has an AKC Canine Good Citizen certificate and completed the therapy dog training program with Dog B.O.N.E.S. headquartered in Scituate, MA. 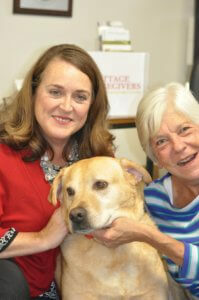 Gurnet has worked at both the Marshfield and Scituate Libraries as part of our volunteer work. Therapy dogs are family owned pets that have great temperaments, love people, have good obedience skills and have an owner that wants to share their dog with others on social‐based visits. “Gurnet and I enjoy making people happy. We love working to bring smiles on people’s faces and allow them the opportunity to spend time with a pet as it makes you feel good!” said Bonnie Peterson, Gurnet’s owner. “We know that spending time with our pets and animals elevates our mood, makes us happier and feel connected. We are so excited to be involved with Bonnie and Gurnet and to be working together to reach the seniors in the community. This program allows seniors to spend time with an amazing therapy dog who brings happiness and joy to all he meets!” said Karen Carroll, Managing Director, Cottage Caregivers.